Click the button below to add the Copper Range Hood '0206' to your wish list. 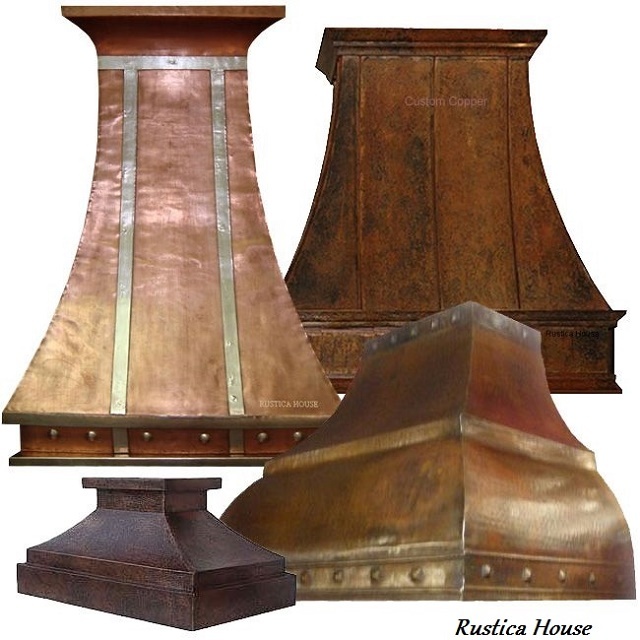 Range hood made of copper influenced by old European style. It has a high round apron decorated with straps. The buyer can select hood patina color and width. This range hood can be made in custom dimensions as island or wall mount. The example shown of the listing photo is natural finishing. As an option we offer 200CFM ventilation unit with light and filter installed or preparing the hood for any other exhaust system. The purchaser shell select $200 custom work option to have it customized for the insert. Delivery of a range hood to the US takes about a month. Rustica House suggests contracting an experienced installer for this kitchen appliance correct installation. Caring for the range hood copper is not difficult. Do not use abrasive cleaners, brillo pads and sharp brushes. Clean the hood with hot soapy water and scrub with a soft nylon brush. When finished dry the range hood with a soft cloth or towel. Avoid its contact with acidic foods or citric fruits. They might discolor the metal.